Who: All types (and colours) of hair. 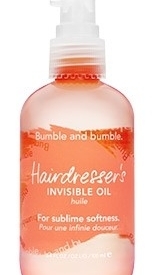 When: Anytime, to soften, smoothe and reduce frizz, tame flyaways, detangle and strengthen hair against breakage. How: Work sparingly into damp hair before air drying or blow-drying, or smooth through dry hair for a sensational finish. Try it with Thickening Hairspray for a soft, tangle-free blow out, or as a finisher after styling to control flyaways and add polish.